Unlike Samsung’s Galaxy Fold and Huawei’s Mate X, which fold horizontally, the prototype device that Sharp just unveiled closes in on itself vertically, making it more like a traditional phone that can be folded in half. We’ve already seen a very similar design from Motorola, whose $1,500 Moto Razr concept is also a clamshell-style foldable that can be turned into a very compact size. 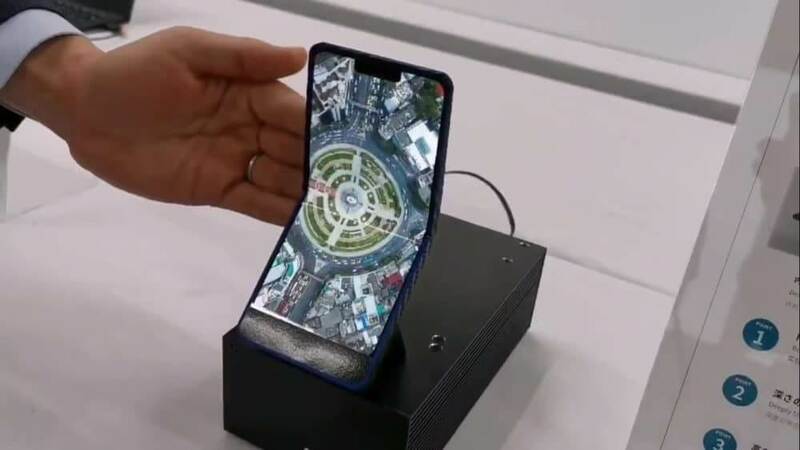 The device here features a 6.18-inch, 1440 x 3040 AMOLED screen that’s reportedly undergone 300,000 fold tests—100,000 more than what the Galaxy Fold experienced during its stress testing phase. Another similarity with the Razr foldable is the notch, which could be the element that puts most people off. Sharp has said, however, that a commercial version of its device won’t be ready for “a few years," by which time notches might have fallen out of fashion and the final design could change. A recent report on the mobile industry predicted that foldable phones would remain a niche product for several years, and even by 2023 would only have captured 5 percent of the market. We still don’t know how consumers will take to the devices, but these vertical designs appear to be getting more positive responses than the book-style, tablet-sized foldables. Nowhere in the article did it say it used glass though. It's plastic OLED. As a user experience designer, I question why on earth someone would need a phone to fold like this. It takes up just as much space, but now it's fat vs skinny and long. Maybe you protect the screen from scratches? But at the cost of bending the damn thing and having to repair that at some point. Regardless of the technology, the cost is going to eliminate it from a LOT of budgets! Foldable screens, a gimmick aimed solely at those with too much money and not enough sense. Well Said, Rob the folding phones are the hot topic these days as more and more companies are launching new phones with folding phones and tablets. One should be and is concerned about the portability and the durability, my understanding is that the phones will become heavier and bulgy. Not to mention the priceeee, the pixel quality, screen clarity and the connectivity options! Will they have 5G ? Flip phones are back baby!! Easily the most rewarding way to hang up on someone ever. That Dude There likes this. Sharp's approach is exactly what we need. Smartphones after Android 5.x or around that are something very different than phones before, they offer so much functions, but the problem is they are ridiculously big today. Old Nokia phones were often more basic, but even their flagship phones were not super big. Samsung and Huawei approach is to make the display once again even larger by foldability! Their current examples are already rather big, thick, bulky, but this must be all good if you can have that massive display inside your pocket right? What for though, for watching movies? I already have to keep 5,2 inch display rather far away from my eyes to avoid strain. We need phones with displays around 4", 5" or 6", not anything larger and all these with slim bezels if possible. A phone should be something that you put comfortably into your pocket and hold it in one hand. All apps are designed to utilize the small space and functions already, but big displays mean more compromises to app design and hassle with two hands. Often it is hard to handle a big phone swiftly and hold it firmly at the same time, so your drop it more often. If I need a big display, I buy a TV and watch content on that. If I'm on a bus or just visiting some place, 5" display inside my pocket is more than sufficient to enjoy an occasional video. I really hope Sony still retains it's Compact series which is currently excellent. Sony Xperia XZ2 Compact is a real phone with a sensible display, it feels nice to hold in one hand, is comfortable to hold next to your ear, is very practical when you listen to music through your headphones and change songs, is a real compact camera with a shutter button, runs fast and has a great battery life, unlike some phones which massive display drains your battery way too fast. Sharp is on the right track. Others, not so much. Credits to Samsung though for Galaxy S10e, which is a step in the right direction, but Sony easily still takes the cake by packing all essentials in one simple, small and practical package (without glass back) that is a joy to use. I do miss flip phones myself, I still have my old Razr V3i. I just think that folding screens are going to make phones even more of a throw away device as those screens will end up creasing very easily which will make them hard to sell on when you want something new. 5G is something that phones like Samsung and Huawei are "smart" enough to adapt to, I don't think Sharp will have the technology for this. Also, connectivity shouldn't be an issue because these phones will have wifi option, I'm sure getting a good router and connection and it the fix here. I think 5G is not only limited to Samsung and Huawei many Chinese manufacturers are also jumping in and cashing this new technology. I was concerned about the 5G as my router here is like busted and am unable to get the connectivity through that channel and its kinda expensive if you compare it with 4G which currently I am using.